Make a lasting memory in Wax. 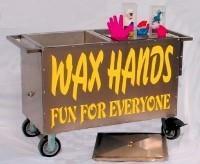 Wax Hands will give your guests a little something extra to remember your event. After dipping their hands in the soothing hot wax they will take home that image of their hands. Great addition to any event such as Bar / Bar Mitzvahs and, Graduation parties.